As much as I should really criticize this film, I find myself on the fence. 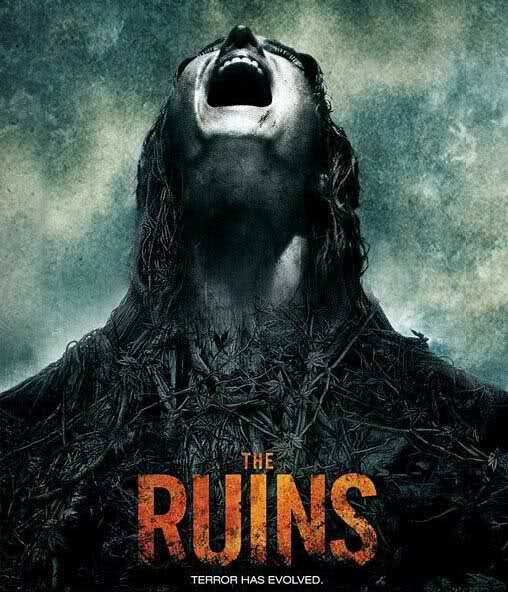 Despite being full of tired clichés and possessing a storyline which essentially is a combination of two other films, The Ruins was still quite enjoyable. The two films I refer to are The Beach and The Descent, to anyone who has seen these two contrasting films, you will immediately connect the dots upon watching this film. The Ruins starts off on the slow side, picks up in the middle and sadly falls away towards its conclusion which starts to resemble a mediocre creature feature. A group of friends, Jeff, Amy, Eric and Stacy are vacationing in Mexico when they are joined by a mysterious stranger, Mathias. Jonathan Tucker, Shawn Ashmore, Jena Malone and Laura Ramsey play the group of friends and Joe Anderson plays the mysterious stranger. Mathias tells the group about an unearthed, previously lost Mayan pyramid which must be seen. They all set off in search of the rather poorly hidden “lost” pyramid but on arrival they run into a couple of armed locals and things turn bad fast! Initially, drugs must be the cause for the concern as the pyramid is covered in what appears to be marijuana plants although none of the characters seem to make that connection but looks can be deceiving and some unnerving horticultural delights turn this film into something fairly different. The cast cope rather well with the lacklustre script which does very little to bolster the below par “copycat” storyline. Stand-out performances from Tucker and Ramsey whose characters complement one another perfectly as Jeff (Tucker) is going to med school to become a Doctor and Stacy (Ramsey) decides to perform a little D.I.Y surgery in one of the best visual scene’s in the film. Shawn Ashmore who is perhaps best known for playing Bobby “Iceman” Drake in the X-Men films does a good enough job at playing a role totally different to that of Iceman but he fails to really make a name for himself with this one. Needless to say, The Ruins meanders through its chewing gum storyline with very little to worry about. Not enough empathy is built up for the characters who, as I have said try their hardest to make this film everything it could have been if released ten years earlier. A very good production value and some visually impressive shots keep you watching but that’s where it ends I’m afraid. Like I said in the beginning, anyone who has seen both The Beach and The Descent will probably not be as impressed but through its unoriginality, some glimmers of hope can be seen and this is always enough for me to justify watching.